Psychologists have all sorts of names for it – ego depletion, decision fatigue – but it comes down to the fact that every day, we have a finite amount of self-control we can exert. We’re only capable of making so many ‘healthy,’ ‘good,’ self-denying decisions in a given day. Once those are exhausted, we’re a million times more likely to eat nachos for dinner, fall down an Instagram hole, and throw our clothes on the floor. I don’t know about you, but it is alarmingly easy for me to abandon my good habits and best intentions. Hanging another hook in my closet for workout gear so it’s visible and accessible = I’m (somewhat) more likely to workout. Storing cleaning wipes under the bathroom sink = we’re all more likely to wipe the sink down. Tucking a few postcard stamps in my wallet = I’m more likely to send postcards when I’m traveling. Of course, none of these tiny changes increase my energy or my desire to actually, uh, engage in the good habit in question. But they do remove one or two of the tiny, annoying hurdles that prevent me from doing the thing I know I should be doing. 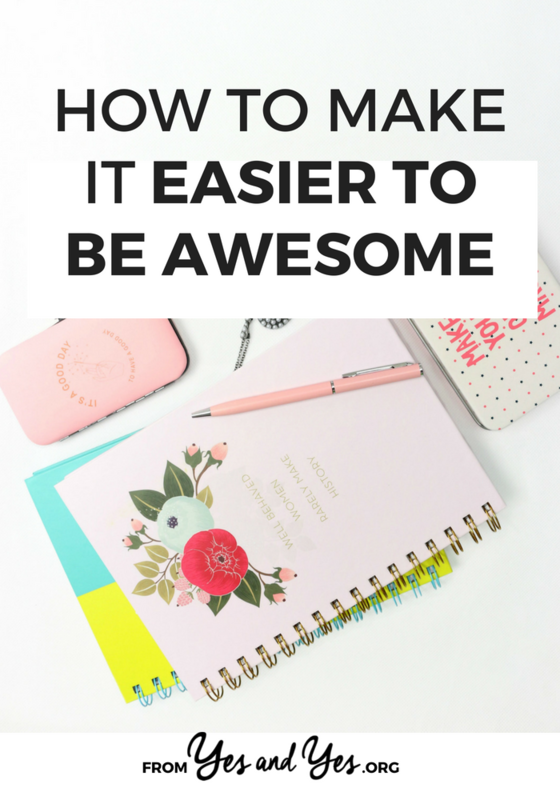 How can you make it easier to be awesome? How can you remove the tiny hurdles that stand between you and what you want? How can you make ‘good’ things more accessible and ‘bad’ things less accessible? buy fruit and vegetables you can eat without any peeling or chopping – cherry tomatoes, blueberries, raspberries. So if you, like me, occasionally struggle to pull your spoon out of the peanut butter jar at 9 pm or shutdown Netflix after a long day – you’re not alone! And there’s nothing wrong with you! You’re a lovely, normal human whose brain just needs a break from making decisions and exerting self-control. Luckily for all of us, sometimes it’s as easy as putting the peanut butter behind the bag of quinoa. But I want to hear from you! How do you navigate self-control and decision making? And do you ever find yourself making increasingly questionable decisions as the day progresses? Love the little tips, especially the ones on eating healthier. I always feel guilty about buying prepackaged and precut greens, but hey, if it makes me eat more veggies, then it’s a great thing! THIS forever. I ADORE leafy greens, but have realized I really really hate washing and drying them. I end up splattering water all over what I’m wearing, it takes forever, uses up a bunch of paper towels, and they’re never quite dry enough. Buying pre-washed greens was such a game-changer; I now eat greens with 2, sometimes even 3 meals a day. 100% worth it!! I, too, have a Roomba and am in love with it! 3 dogs + dark floors= a nightmare without it! I do, occasionally, worry about the dreaded scenario that shall not be named. Roombas FTW! And I love the idea of taking off your makeup before it’s 10:45! Funny! I’ve been reading The Science of Willpower by Kelly McGonigal and she explains exactly why self-discipline is difficult and how we can improve it:) It’s a really good book and so far it is working for me, so you may want to check it out! I didn’t even realize this was a make-the-good-things-easier hack until you mentioned it, but amen to an easy-to-make bed. My bedding revelation (because that’s a thing) was when I lived in the UK and discovered the duvet system. No more bunchy flat sheets to fight with and line up with the comforter? Sign me up. Now I just pull the duvet over the pillows in the morning and boom! Bed made. Thank you Sarah – that is such a great way of managing it – make the yucky stuff easier to do! I try to implement the concept of pairing hates & likes together & The Power of Small. When I am doing the dishes (hate), I pair it with music that I like. I set my timer for 5 minutes and tell myself that I only have to do the dishes for 5 minutes. By the time 5 minutes comes, I am halfway done the dishes – if I do them every other day – and I am enjoying my music and I am in the zone. I also do not do something that I hate to do everyday because then it feels like I am always doing it. For example, washing dishes – I will rinse them and place them neatly organized on my counter, but I will not wash them everyday. I will wash them every other day. That way I feel like I am getting away with something and it is still a manageable situation. I also have a selective substantial treat of whatever I want earlier in the day – usually before 12 noon. Usually 2 cookies or 1 cup of ice cream, or a piece of cake. That way I am not demonizing food, I am not denying myself and I develop the concept of that I can eat and enjoy whatever I want – it’s just all about the right amounts and ratios. Thank you again for sharing your wonderful strategies – I’m going to start implementing them to make it easier to be awesome ! I love the idea of pairing something you hate with something you love! Thanks for the suggestions. Yes, you’re right…a dishwasher isn’t an option! I have a rule that I try not to make any decisions for the first hour of the day, so that I can save that energy for more important decisions later in the day. So I have the same thing for breakfast every single day (and usually prep 5 of them on the weekend to make weekdays easier) and before I go to sleep at night I always make a plan for what I’m doing, what I’m wearing and where I’m going as soon as I get up the next morning so that I don’t have to think about it. These are such great tips, Sarah. I’m often the opposite–I START the day on the wrong note, and it seems to bugger up the rest of the day. But I want to get better. Really, I do! Any tips besides “Well, start the day on the right note, you fool”? I smiled when I read your suggestion about leaving workout clothes on the floor. I can just see waking up, stretching, and looking down to find three cats curled up on my yoga pants. 🙂 But I do wear them to bed if I’m going to be working out at home. I thought I was the only person in the world who did that! The other thing I prepare in advance, is answers to likely and emotion inducing questions. Then I am able to use my energy to be awesome in relating to people. How is your unstable mental health? When are you having children? Why didn’t you come to my party? I have paragraph answers to these questions ready to go. Also our breakfast things live out on the bench – don’t even need to open a cupboard in the morning. Can confirm: Milika is very awesome at relating to people. Yesssssssssssssssss. This is so true, and why meal prepping all my breakfasts and lunches for the workweek has become a linchpin habit. I spend about an hour (or two depending on how fancy I feel) on Sundays pre-packing all the meals I’m too busy to care about during the week and it sets me up for SO MUCH SUCCESS in so many other areas of my life. I’m gonna look for ways to make good decisions easier this weekend. For making healthier lunches, making a little extra of dinner that you can bring the next day for lunch is a big winner for me. Or making extra that you can stick in the freezer as a back-up. The hardest thing for me as the mom of two really little kids is that so much of my willpower is exhausted by taking care of them after I come home from work. Little kids are both physically and emotionally tiring! Yes! After we finish eating dinner, I box up the leftovers into our lunches for the next day. Then, in the morning, all we have to do is grab a box and a piece of fruit and lunch is ready to go. That’s a lot easier than having to go out and forage at lunch time. These are really great tips! Especially about preparing foods or buying already washed veggies. I struggle with grabbing things because it is easier. Chips are always easier than prepping a healthy snacks. I think I’m going to book mark this so I can come back to this as a reminder! “use more hooks, baskets, and open-topped storage” — I realized a couple of years ago that if I need to open up something or put a lid back on a container, I just will not do it. Stupid, but true. Now, yes, I organize my makeup on a plate & cup (instead of a cute makeup box), keep my jewelry in clear open-top boxes, etc. For food, I start off with a super healthy breakfast and make sure I save any sweets for later in the evening. If I have something sweet at lunchtime, I spend the rest of the day craving more sugar and having to deny myself. If I wait until the evening, I spend the whole day wanting sweets and then can reward myself after dinner. Starting off with a super healthy breakfast also helps if you need to get something on the go during the day. It’s hard to find veggies, fruit to go. It’s much easier to find carbohydrates — pizza, bread, muffins, etc. If you have a great breakfast, it’s OK to get a muffin in the afternoon! My first reaction to this post was, “meh. I already know to keep the twinkies on the top shelf out of reach.” BUT THEN. Over the next few days, I started thinking, “How do I make it *easy* to [insert good habit here]?” I am now keeping a case of bottled water in the car so that I can easily drink more water each day. Thanks Sarah! For more in this vein, check out the recent book Change Anything! Willpower is not enough when the whole world is conspiring against your good habits!